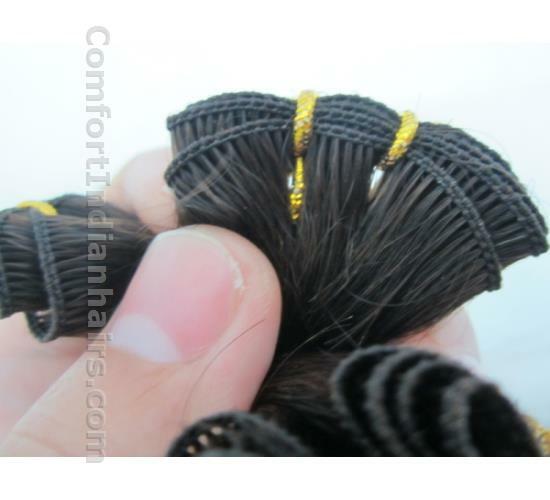 Hand-tied wefts are thinner and more flexible than machine-tied wefts. 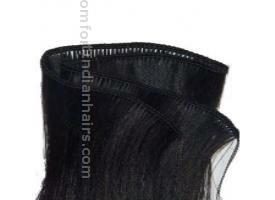 The weft is flatter and allows the Remy hair extensions to lay closer to the head giving a more natural look. 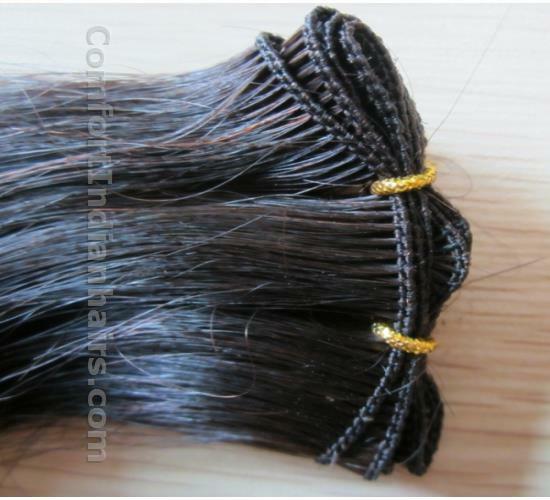 Typical hand-tied wefts come in pieces about 24 inches in width. When sewn in, they can be folded over to best fit the track. 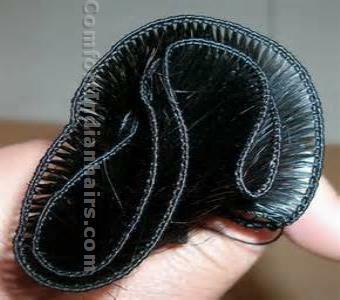 The weft is flexible so it will not stick out or cause lumpy areas around the crown. 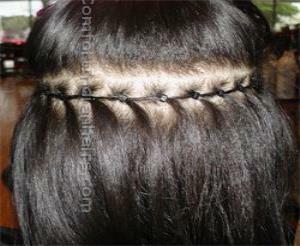 Micro hand-tied wefts are another option found mainly in Asian hair. 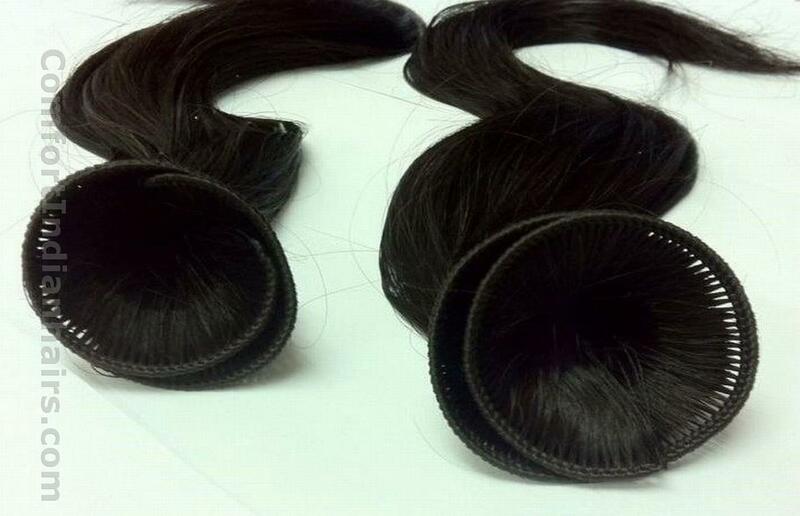 These wefts come in 8 to 10 inch pieces with wefts sewn closer together. 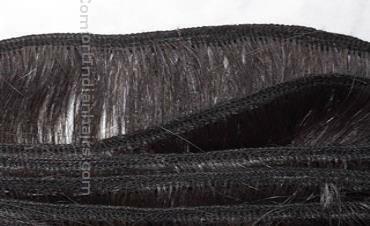 High quality hand-tied wefts tend to last longer without shedding when they are put in by an experienced technician. 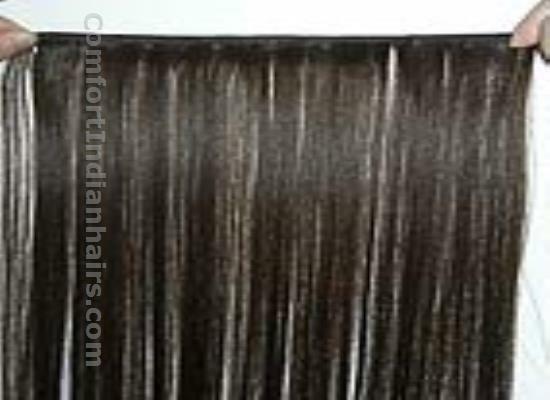 Another limitation of hand-tied wefts are that due to the slimness of the weft, you can only really sew in the tracks, bonding the glue to the slim weft without getting any on the hair is quite a challenge and can be quite messy. Despite these limitations we highly recommend hand-tied wefts, our suppliers are specialists in hand-tying and knotting and have taken the craft to a whole new level. Anyone who sees our beautifully made wefts agree that they are truly an art form, our wefts are strong, secure, and don't shed or become hard and sticky. A hand-tied weft is essentially a seam that holds all of the base ends of the hair together and is manually woven into the weave by a human and custom attention is given to each weave whereas a machine weft is hair that is fed into a machine and weaved tightly into the seam, this happens in a manner similar to that of the sewing machine. For your whole head, you need 8 to 10 pieces. 8 pieces for a normal hairstyle, 10 pieces gives you a perfect full head of hair. There is greater control over ensuring stability and security of the hair extension, which means the client will experience very little shedding, if any. 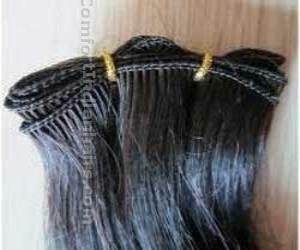 Hand tied weft hair extension are chosen from health, young, stretchy Indian human hair luster, smooth, silky and soft. All the hair weft is made by hand-knotted on a very thin weaving, so very thin weft is easy to hide in your own natural hair and no bumps. You just need to tie with your own hair then you will change the length and color of your hair quickly, beautiful and expeditious way of fashion. Length: 10" to 30" available. Weight: Usually each packs 100 and 25grams.